This is an absolutely wonderful looking new study about the interaction of various religious traditions in the pre-early-medieval period — Jacob Lassner’s (Northwestern) Jews, Christians, and the Abode of Islam: Modern Scholarship, Medieval Realities (Chicago 2012). The publisher’s description follows. In Jews, Christians, and the Abode of Islam, Jacob Lassner examines the triangular relationship that during the Middle Ages defined—and continues to define today—the political and cultural interaction among the three Abrahamic faiths. 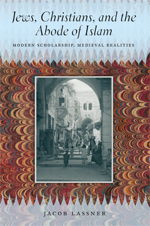 Lassner looks closely at the debates occasioned by modern Western scholarship on Islam to throw new light on the social and political status of medieval Jews and Christians in various Islamic lands from the seventh to the thirteenth centuries. Utilizing a vast array of primary sources, Lassner balances the rhetoric of literary and legal texts from the Middle Ages with other, newly published medieval sources, describing life as it was actually lived among the three faith communities. Lassner shows just what medieval Muslims meant when they spoke of tolerance, and how that abstract concept played out at different times and places in the real world of Christian and Jewish communities under Islamic rule. Finally, he considers what a more informed picture of the relationship among the Abrahamic faiths in the medieval Islamic world might mean for modern scholarship on medieval Islamic civilization and, not the least, for the highly contentious global environment of today.